Telling It Like It Is. | Sometimes I'm snarky. Sometimes I'm not. It's up to you to figure it out. Slightly off the beaten path but well worth the drive, Walker’s Grille is a new, eco-friendly restaurant that recently opened in Alexandria. The restaurant is part of a new, environmentally conscious building concept—it is located in a Leadership in Energy and Environment Design (LEED) building and its mission is to meet, maintain, and perpetuate sustainable practices and implement green design and green restaurant strategies. All that eco-friendliness and green modeling and the food’s good, too. On a recent rainy Sunday afternoon—and despite being located in an office park—the dining room was packed. My three dining companions and I were seated in the bright and spacious dining room. We were immediately overwhelmed by the choices in front of us—not because there were too many items on the menu (a la Cheesecake Factory) but because there were so many options that sounded so good. We each ordered an appetizer. And, okay, we may have gotten one extra. We started with the frites, the crab and shrimp dip (with a crusty French baguette), mussels, filet sliders, and the fried prosciutto wrapped mozzarella. If I had to pick one item on the menu that I liked more than any other, it would be the mussels. Not generally a seafood person, this is a bit surprising. The wild Maine mussels were served in a broth of caramelized fennel (which I also hate! ), shallots, grape tomatoes, bacon, and Sambucca cream. I really could’ve poured it into a glass and sipped away. The portion size was ample for sharing—we even had some left over. The bread that accompanied the mussels was perfectly toasted and ready to sop up the broth. The shrimp and crab dip was chock full of both fruits of the sea and had a great creamy base—which, even to me, didn’t need even a grain of salt. The bread was warm and crusty. If you don’t like cheese of the moldy variety, the filet sliders may not be for you. While the thin layer of Oregonzola horseradish butter that was spread upon the medium cooked piece of filet (and under the caramelized purple onions) was not overpowering, it definitely gave the three pint sized burgers an extra kick. What I was most excited to try were the fried “prosciutto” wrapped smoked mozzarella. The “prosciutto” is in quotes because it is, in fact, a thin slice of Virginia Surryano ham…but you could’ve fooled all of us. Definitely tasted prosciutto-y. So, get this: take a thick round of mozzarella. Put a piece of basil on it. Wrap it with the ham. Pop it into the deep fryer. Put it on a long platter on top of a balsamic reduction and top it with cherry tomatoes. It’s as rich as it sounds. And who doesn’t love some fried cheese? And pork? Some of my fellow diners had a good time trying to redevise the dish—deconstructing it, serving it as a slider. The components of the dish make it ripe for interpretation. I’d say the frites were my least favorite, but only because they had some stiff competition. They are handcut and were cooked so that they were not too soft, not too crisp. The lemon thyme dipping sauce was a fan favorite. There was also a peppercorn sauce of some sort and a sweet chutney (with a hint of cumin). By the time our appetizer plates had been removed, we were full. But onward we went. We had two burgers at our table—the ‘Shroom and the L’oeuf. Both were made from Meyer Natural Angus beef and cooked to specification. The ‘Shroom came completely smothered in Gruyere, caramelized onions and, of course, the Cremini mushrooms. The L’oeuf (or egg, for those of you who aren’t Francophiles) was a diner lover’s dream (or someone who’s hungover): a perfectly cooked fried egg that released its yolk upon touch lay atop the burger patty and was accompanied by muenster cheese (a non-classic choice), caramelized onions, bacon, and a truffle aioli. All kinds of different flavors, all good on their own and all working perfectly together. The only downside to this selection was its mess factor—the fork and knife come in handy. The Chicken Francaise was better the next day than it was the first. This tells you two things: that there was so much I couldn’t finish it in one sitting and that I, someone who doesn’t like leftovers, liked it so much that I did, in fact, eat it two days in a row. The chicken scaloppini lived up to its proper definition: small, thinly sliced pieces of meat dredged in flour, sautéed, and served in a sauce. Except it wasn’t a small piece of chicken. The sauce was a lemony one, the acidity of which mixed well into the house made linguini served alongside it and worked with the spinach, artichokes, and sundried tomatoes that came atop it. The bitterness of the tomatoes, the bland (in a good way) of the wilted spinach and the tart of the artichoke and lemon sauce all melded together in such a nice, comforting way. The last entrée we had was the buttermilk chicken. A huge breast that was fried, as the diner said, “perfectly.” Moist chicken, crispy crust…made you just want to take a bite onto your fork and dip it into the truffled mac and cheese that came with it. Except that each element was so good on its own you didn’t really want to mix them but, rather, savor each on their own. Sometimes—more often than not—the flavor of truffle can be too much but, in the case of this side, you only tasted it at the very end, allowing you to really enjoy the fancy cheeses and al dente pasta before the surprise of the truffle hits you. This entrée also came with peas, carrots, and cipollini onions, but you know how I feel about veggies. Think we should be full now? Beyond the ability to put another bite in our mouths? You are mistaken. We had dessert. What’s another couple hundred calories at this point? And how can you not when you know they’re all made fresh daily? We shared the carrot cake, a chocolate mousse cake, and a pineapple upside down cake. If forced to rate them, I would, in that order, best to less best. The carrot cake was moist and tall and had just the right amount of cream cheese frosting (with a hint of vanilla—I love icing with a hint of something special added into it). The chocolate mousse cake was exceptional because it was a biter dark chocolate mousse and not the boring milk chocolate variety (and, part of that deliciousness came from Nutella); the bottom of the cake was a hazelnut cookie crust—another pleasant surprise. The cake sat on top of a generous pool of pomegranate coulis, the tartness of which worked well with the bitterness of the dark chocolate. The pineapple upside down cake was more crunchy waffle than it was cake—in fact, it was kind of a turnover and not upside down. Regardless, it was tasty but didn’t compare to the other two. I went 27.5 hours before I ate again. Possibly one of the best Italian meals I’ve had. Ever. And not enhanced, at all, by the fact that Angie Harmon and Jason Sehorn were sitting less than 20 feet away from us. Angie Harmon was at the same restaurant as I was. And we didn’t even realize it until we were leaving. Now, I’m not sure what she ate for dinner that night, but what my fellow diners and I had was a pleasure to the palate. We started with salads and meatballs. What? You didn’t know four perfectly sized, perfectly seasoned, perfectly perfect meatballs could be an appetizer? Well, they can be. And they were. A mixture of beef, veal, cheese, heavy cream, herbs and spices (and, as one of my friends said, “a little bit of heaven”). Topped with a bright red marinara and shaved piave vecchio, the four healthy sized meatballs were a great way to start off the meal. Obviously, ordering the meatballs as an app allowed me to indulge in their deliciousness while freeing up my entrée options since I no longer felt obligated to order the spaghetti and meatballs. I wonder if Angie Harmon had some meatballs. Pre-entrée, my dinner pals and I also had salads. Two of them had the Vivace seasonal salad, which was a rainbow on a plate. Loaded with grapefruit, oranges, goat cheese, spiced walnuts atop mixed greens, served with a lemon honey vinaigrette. For a cold day in January, this was a refreshing treat, summoning visions of summer and sunshine, not slush and bitter winds. I shared a Caprese salad with a friend. It was delicious. A take on the tradition tomato, cheese, and basil setup, this salad came before us slightly altered. The tomatoes were roasted and slightly charred. The tanginess of the tomatoes was nicely offset by the slight char from the roasting; this choice of preparation also allowed for the tomatoes to retain their moisture and remain decadently juicy (which may not have been the case had we gotten regular, plain old boring sliced tomatoes out of season). Instead of leaves of basil littering the plate, these tomatoes were covered with a perfect basil pesto. And, the mozzarella–soft and buttery and served in perfect proportion to the tomatoes and pesto. Because I had gotten my taste of the meatballs with my brilliant appetizer selection, I opted for the pappardelle alla Bolognese. The thick, ribbon-like pasta was covered generously with the savory Bolognese. And an added bonus? The goat cheese crema (when is goat cheese ever a bad addition, really?) and more of that delicious piave vecchio. The best thing about this dish was that you could get it in two portion sizes. I opted for the smaller one and finished every last morsel and was quite sated. Had I ordered the bigger portion, I would have probably finished every last morsel, as well, so as not to let any go to waste. We had two orders of the spaghetti and meatballs arrive at the table. Usually considered a favorite among the much younger set, this was enjoyed by my 30-something friends with as much glee as if they were 5-year-olds. The meatballs on top of the spaghetti were a tad bit larger than the appetizer portion and were a generous quantity (five!). The sauce, while labeled on the menu as “tomato sauce” is, in fact, a little bit creamy. The spaghetti is a bit thicker than your average spaghetti, allowing the sauce to stick to it heartily. The secret to ordering this—and to jazz it up and make it a bit more adult—is to order it with a few shakes of red pepper flakes. The difference is dramatic. The final entrée for the table was the chili-capellini and lump crab. One word: amazing. The capellini was a vibrant red from the chili and the flavor was quite evident—but not overpowering. The roasted tomatoes, garlic, and generous portion of lump crab meat downplayed the spice nicely. Again, a clean plate. And, because there were four clean plates (and that’s just the entrees!) we had no room for dessert. But it was well worth it to give up the calories. I wonder if Angie had dessert. Deconstructed olive. Tasted like the dredges of a dirty martini. Beet salad with goat cheese fondue, gelee, balsamic glaze, and pink grapefruit. Fennel wrapped in Virginia ham with shredded green apple salad and a citrus vinaigrette. Pumpkin (or was it carrot??) soup with cinnamon foam and some kind of delicious oil. Lamb sous vide with spaghetti squash and garlic paper. Rabbit ravioli with a chanterelle ragout. Sorry, Thumper. Champagne sorbet made with liquid nitrogen, a la Richard Blais. Dessert: saffron cream, dark chocolate truffle covered in cocoa, candied carrot over a carrot/raisin bread. To celebrate my brother’s 30th birthday, we went to CityZen, located in the Mandarin Oriental. I can’t think of a better way to have ushered him into his fourth decade than this. We sat down and were immediately greeted by our server. He welcomed us to the restaurant and immediately took our drink orders. Soon thereafter, our beverages arrived and our new friend was ready to start answering questions and telling us about our choices. The restaurant offers three choices for dinner—a six course tasting menu, a three course menu, and a six course vegetarian menu. With the six course, you do not get to make any choices; you eat what you are served. We each opted for the three course menu so that we had some control over our choices. Side note: because, when making the reservation, we told them it was my brother’s birthday, the server took a moment, after taking our orders, to hand my brother a birthday card signed by the entire staff of the restaurant. A nice gesture, we thought. Before the appetizers arrived, we were treated to several canapés. Slightly bigger than an amuse bouche but smaller than a traditional hors d’oeuvre, these surprises were all fantastically marvelous. The first was a sous vide lobster custard. Usually, when you think custard, you think sweet. This savory custard was a masterpiece and we all savored every last drop. The custard was smooth and creamy and, because it was prepared using lobster shells, the flavor was deep and authentic. Topped with a tiny round brioche, and a lobster infused oil, this was a canapé worth every last calorie. The second canapé was an olive oil custard. This was tasty, as well, but extremely rich. It tasted much like a soft boiled egg so, if you’re not into that taste or texture, this may not be the choice for you. I ate the whole thing [of course] but could have been fine without it. Another side note: the iced tea came with simple syrup. Nothing better than true sugar water. Splenda be damned. As we finished our canapés, we were surprised with another treat: the travelling bread basket! We were given a choice of white, wheat, or ciabatta bread (and could have as many slices as we wanted!). The best part of the bread experience was the butter. We were given two kinds of soft butter—a sweet butter (which tasted fabulous on the wheat bread) and soft salted butter. Doesn’t get much better than that. Finally, our first courses arrived. 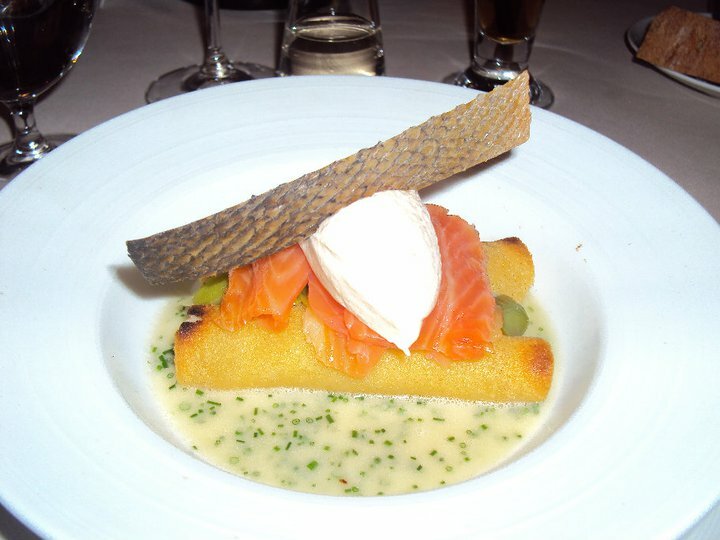 I had the potato blintzes with smoke salmon and salmon mousse. As one of my dining partners stated, “It tastes like a Jewish holiday.” The potato was a fabulous puree that was smooth and creamy. The blintzes reminded me more of a taquito in terms of their texture on the outside and the fact that they were rolled in a tube shape. There was a generous amount of salmon mousse set atop the two blintzes. 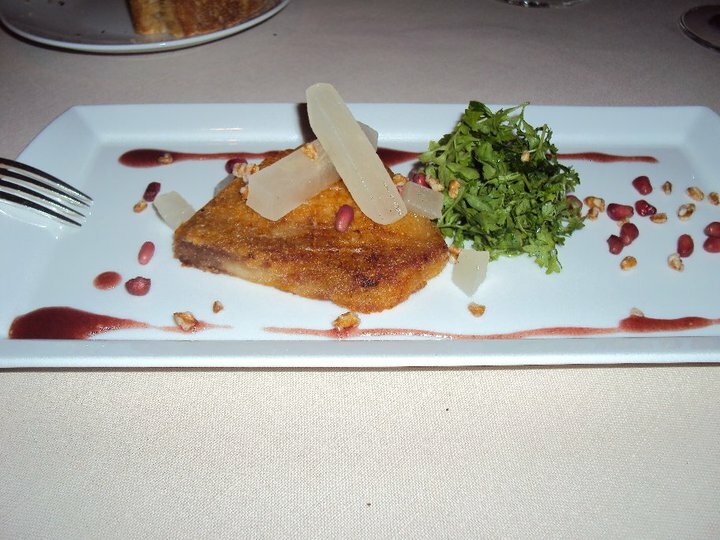 My brother, of course, ordered the pork jowl confit. He always chooses the “weird” meats. It was so tender and melted in your mouth, though, so not a bad choice on his part. There was a sweet sauce, pomegranate seeds, and pine nuts that decorated the plate. The other appetizer that appeared before us was the artichoke agnolotti. The pillows of pasta were stuffed with a creamy puree of artichoke. Not generally a fan of artichoke, even I had appetizer anxiety and envy over this one. 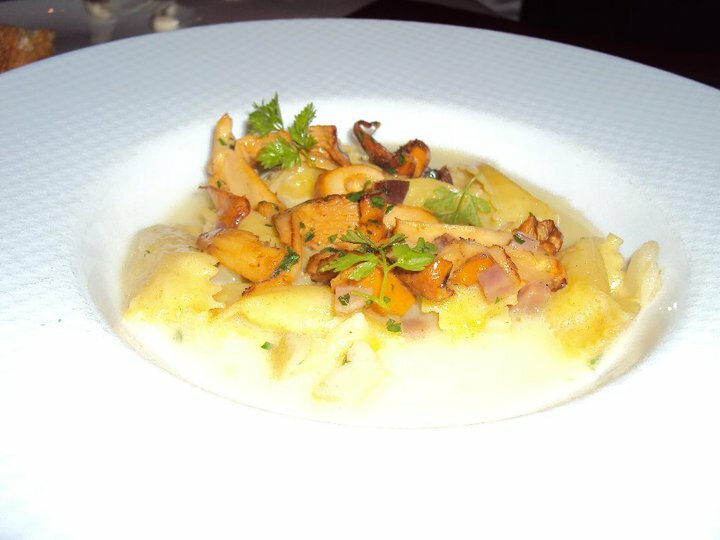 The agnolotti was topped with beautifully seasoned chanterelle mushrooms. There was just enough sauce to cover the pasta and to leave a bit for ciabatta dipping. On to the entrees. Three of the four of us ordered the veal. 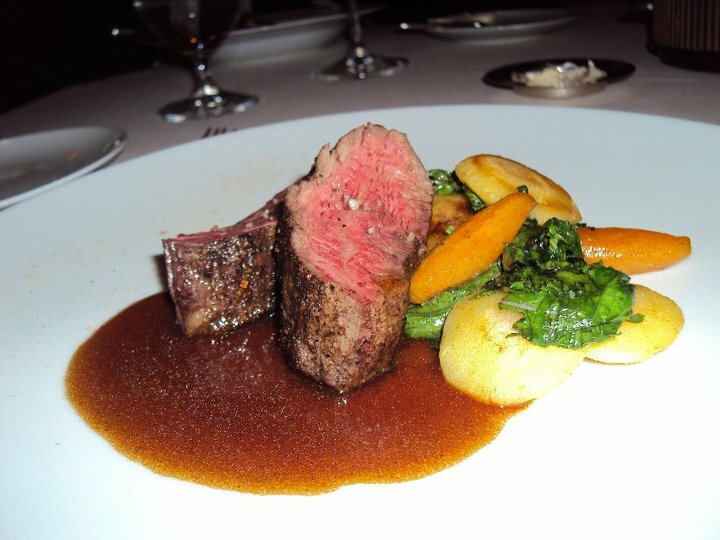 Served with a rich jus, the veal was so tender it did not even need a knife. Served alongside was a potato concoction that was mashed potatoes (with cheese mixed in) that were pattied and fried. The potatoes had a hint of nutmeg that added a fall feel to the meal. 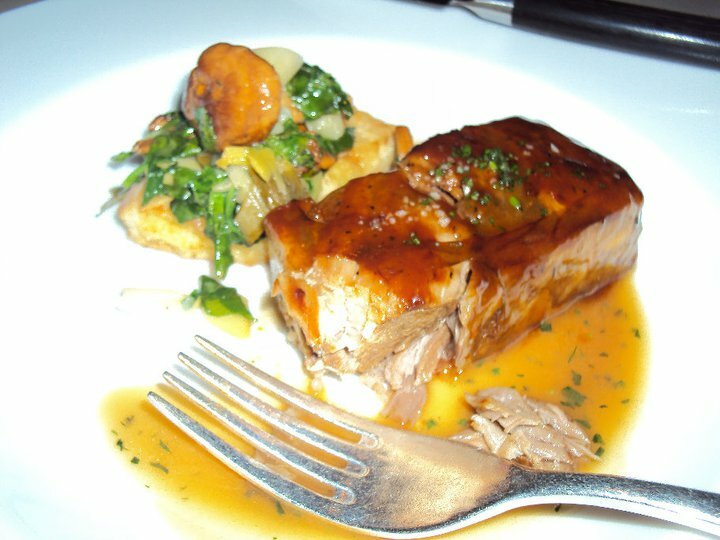 The veal also came accompanied by mushrooms and some kind of green. Our last entrée was the beef option. The cut was “that delicious fatty piece that comes in the corner of a ribeye.” I can’t get more technical than that. Living up to our server’s promise, the beef was cooked to perfection (medium rare) and, like all the other red meat we had sampled that night, melted in your mouth. This entrée was served with fruits of the harvest—pumpkin, most notably. Oh my goodness I almost forgot to tell you about the rolls! Each side of the table was presented with its own small, wooden box filled with mini, house made, buttered, and salted Parker House rolls. First of all, they were the cutest little buns from the oven ever. And they seriously melted in your mouth. We couldn’t get enough—but made do with our provision of eight [for each side of the table]. Prior to dessert, our server came by our table with complimentary prosecco (or sparkling grape juice for those who weren’t drinking) to toast the birthday boy. Another nice—and welcome—gesture. Much to our delight, the parade of servers came around after our dinner dishes had been cleared and offered us a pre-dessert canapé/palate cleanser. Set before us was a Concord grape sorbet with lemon chiffon cake and lemon curd. Amazing. The tartness of the lemon in the cake and accompanying curd went well with the sweetness of the grape sorbet (which was a surprising taste in and of itself). The sorbet, too, had a slight tang, so all the flavors really worked well together. Much like the lobster custard canapé, we kind of wish we had just one more bite. But we needn’t have been greedy, because our own, full-sized, delicious desserts arrive shortly thereafter. Three of the four of us ordered the CityZen SkyBar, the restaurant’s signature dessert. Here’s what it was—the description says it all—milk chocolate biscuit with Valrhona fudge, caramel candied peanuts, and Tahitian vanilla mousse. 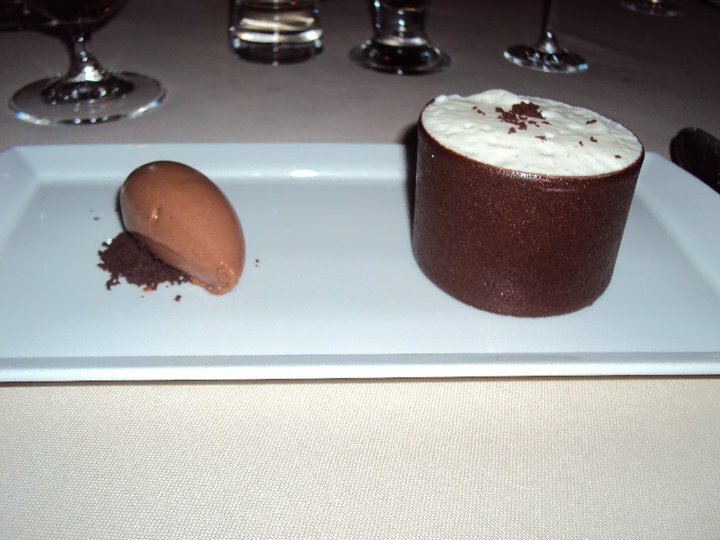 The biscuit was really more of a circular vessel that held within it the layers of peanuts and mousse. The description leaves out the mini scoop of bitter, dark chocolate ice cream (atop some dark chocolate cocoa) that came on the side. It wasn’t too sweet, don’t worry. Oh yeah, our fourth dessert was an apple tart. Green apples, flaky crust…it was tasty but clearly didn’t stand out. Luckily for its recipient, those of us who ordered the SkyBar were willing to share. As if that weren’t enough, with our bill came more dessert! Served on a slate “platter,” we had more dessert choices–four each of a Mission fig macaroon, dark chocolate truffles filled with orange and cinnamon, and a pear gelee. The meal was fabulous. At $80/person for a three course tasting menu with several extra mini courses, the price was comparable to other upscale area restaurants. As our server and new BFF told us, fancy food doesn’t have to be fancy. It’s about taste and texture and the experience. We finally made it to K. After four rescheduled dinners, dinner club finally has K under its belt. Since we arrived a bit early, we sat at the bar for a cocktail before our table was ready (and, happily, were able to sip and chat for as long as we wanted and were not rushed, even though we were at the bar beyond our reservation time). It was nice to sit and catch up. It was not nice to get the stink eye when I asked the bartender if he had a cocktail list I could peruse. I’m not good on the spot, I need ideas. Apparently, I should know better than to be so gauche as to ask for a menu. Vodka cranberry, then, it is. Upon being seated, we were immediately given a wine list—but not menus. In fact, we weren’t given menus until we had been sitting for five minutes or so. While we looked over the menu (which, we noted, was different than that which was on the website—I understand this is normal and should know better than to choose and commit myself to something online), the waiter brought us a bread basket. Filled with a variety of choices (cornbread and slices of white and wheat) the basket was accompanied by a dish of soft butter. Soft butter is key. The cornbread was fantastic—it had a touch of cumin and a kick of chili pepper, which were both nice surprises that were subtle enough that you could taste something “different” but not so overpowering that they took over the sweetness of the corn. Not surprisingly, we each started with an appetizer. Two of us ordered the pumpkin ravioli with a sweet balsamic glaze, crispy sage, crisp prosciutto, and pine nuts while the other two ordered the Hawaiian style tuna tartare “poke” with sushi rice, mango, toasted macadamias and taro chips. Not a drop of anything was left on any of the four plates. The ravioli appetizer (the long plate had four on it) were tender and the pumpkin puree was sweet and smooth, complemented well by the acidity of the glaze. And the sage was a perfect touch. I always forget how much I like crispy greens; it reminded me, a bit, of the crispy spinach appetizer (the palak chaat) at Rasika. The tuna tartare was perfectly seasoned, with the mango adding sweetness and the macadamia nuts adding texture to the appetizer. We practiced a little more individuality when ordering our entrees. As this is a restaurant known for its seafood—and since there was really only one non-seafood entrée option (a NY Strip), we each stuck with the fruits de mer. The most impressive of the entrees was the crispy grilled whole black sea bass with cucumber salad, baby bok choy, and a Chinese fermented black bean sauce. The waiter made sure that we knew that the fish was whole. A whole fish means that it comes with the head still attached and that you have to figure out how to filet and debone it yourself. The fish came curled around the cucumber salad. It was perfectly crisp on the outside, flaky and moist on the inside. The Asian flavors—ginger, sesame, fish sauce—added a complexity to the dish which, otherwise, would be simple but still delicious. Another entrée selection was the swordfish served with cannellini beans and ditalini pasta. The fish was perfectly cooked and topped with a fragrant pesto. The sauce that accompanied the fish was the perfect complement. I stayed “safe” and ordered the cod. But it was topped with imperial crab and served with pureed sweet potatoes so delicious we ended up ordering a separate side order for the table. The dish also came with a stuffing like concoction, the components of which I was never sure but the taste of which I was certain was delicious. There was definitely corn in it—it was sweet like cornbread but had the consistency of stuffing. I also had a small pile of wilted spinach on the side, but, alas, I can’t tell you how that tasted. The fourth selection was autumn themed—a flaky white fish served with carrots, root vegetables, and a beet puree that gave the plate a beautiful fuschia color. The mixing of the flavors was warm and comforting. Who were we to say no to dessert? We tried, we really did, but as we saw plate after plate of dessert parade past us, we knew we had to give it a chance. What better way to try things out than to get two samplers? We ordered the sorbet (mango, passionfruit, and raspberry) and the crème brulee (pistachio, dark chocolate, and salted caramel). The mango sorbet was the star of the desserts—it tasted like summer. Sweet and fresh, the sorbet was so authentic it was as though you were eating a mango half that had been frozen. The passionfruit was very tart. Very. The raspberry was nothing to write home about; we decided it was the best “go to” in terms of sorbet flavors. Each of the crème brulee selections were tasty. The chocolate tasted more like pudding than crème brulee. The pistachio was so subtle we had to be reminded what the flavor was but, once you had it in your head, the flavor became more pronounced. The salted caramel was the best of the three and the only one that we finished completely. The crowd was a bit older, but we enjoyed livening the place up with our youth and our interesting young folk conversation. Parking was plentiful on the street, but the restaurant does validate garage parking. On an expensive or not scale, Kinkead’s falls more on the former side but the quality of the food and its presentation is worth it. The Boathouse is no exception. Located on the James River at Rockett’s Landing (4708 East Old Main Street, Richmond VA 23231), The Boathouse occupies the top floor of the recently restored Power Plant building, which once provided electricity for Richmond’s fleet of trolley cars (aside: how cool would it be if Richmond still had a trolley??). The decor of the restaurant–for it being a seafood restaurant on the water–was not overly themed or nautical. It was, actually, quite tasteful and minimalist and modern. The brick oven in which they make their famous pizzas provided a warm, orange glow to the room and added an air of coziness. The booths were open, large, and quite comfortably seated our party of five. The bar area had high tables with comfortable stools. Per the restaurant’s own managers, they do not take reservations, but we were able to snag one on Open Table. Upon questioning of the [15 year old] hostess, we were informed that they are having issues with Open Table and that they are going to limit reservations to parties of six or more. There were, actually, mostly larger sized parties while we were there, and the dining area filled up quickly and stayed going strong until we left. The restaurant specializes in seafood but offers a variety of other dinner options, as well. We happened to all partake in the non-seafood entrees–and, sadly for the case of writing a balanced review, three of the four of us ordered the filet. But what a filet it was. Cooked perfectly to order (and we each ordered it a different temperature) the meat was pretty much fork tender and melted in your mouth. Accompanied by creamy (as in taste, not texture) mashed potatoes topped off with cheddar cheese and asparagus, this was a selection with which not a single one of us was disappointed. The mashed potatoes were the perfect consistency, each bit flecked with some potato skin (but not in an overwhelming way) and with a lump here and there to prove authenticity. The asparagus, which also accompanied the grilled pork chops (which was the fourth entree we ordered) was the star of the evening. Grilled to the point of being a few shades shy of slightly charred, the asparagus was green and crisp and salted and peppered to marvelousness. The grilled pork chops were also succulent and tender and came with a side of potato and gruyere gratin. Each of us added a half side salad to our entrees for an additional $5. The wedge was “classic,” with bacon, diced fresh tomatoes, and ranch dressing. Rather than the traditional “normal” blue cheese, the Boathouse wedge was adorned with crumbled gorgonzola, which added a nice touch–it was not so strong as to overpower the rest of the flavors. The salad was dressed between layers of lettuce, not drizzled with the dressing so, while it appeared as though you did not have enough dressing (and, really, who can ever have enough ranch?) there was the perfect amount. The pear and gorgonzola spinach salad with sliced onions and a balsamic vinaigrette was also a hit. Note: if you want bread, you have to ask for it. But you’ll be glad that you did. We ended the evening with the Pizzookie which, as you can imagine is, a cookie pizza. What appeared before us was nothing short of magnificent: a chocolate chip cookie the size of a dessert plate, baked just enough to be cooked but not nearly enough to have true cookie consistency. Topped with vanilla ice cream, whipped cream, and hot fudge, this is a dessert not to be missed. It is recommended that you eat it AS FAST AS YOU CAN, as it melts into a soup (albeit still delicious) very quickly. Not to shun a dessert, but I will say it could’ve used a minute or two more in the oven, just to be a better receptacle for the toppings. I can’t write a proper review of The Boathouse without saying that, if you are to make it there for a meal, I’d strongly suggest making it your evening meal and suggest even more strongly that you go at or near sunset. It was breathtaking to see the sun descending over the James, with the Richmond skyline in the distance. The reds, pinks, oranges, blues, and purple were vibrant and stunning and added to the already warm and cozy atmosphere of the restaurant. Though it was chilly the night we were there, we could all easily imagine sitting on the outside patio, cocktails in hand, watching the sun go down on a warm summer night. With a basket of bread and maybe some crab hush puppies in front of us, of course. 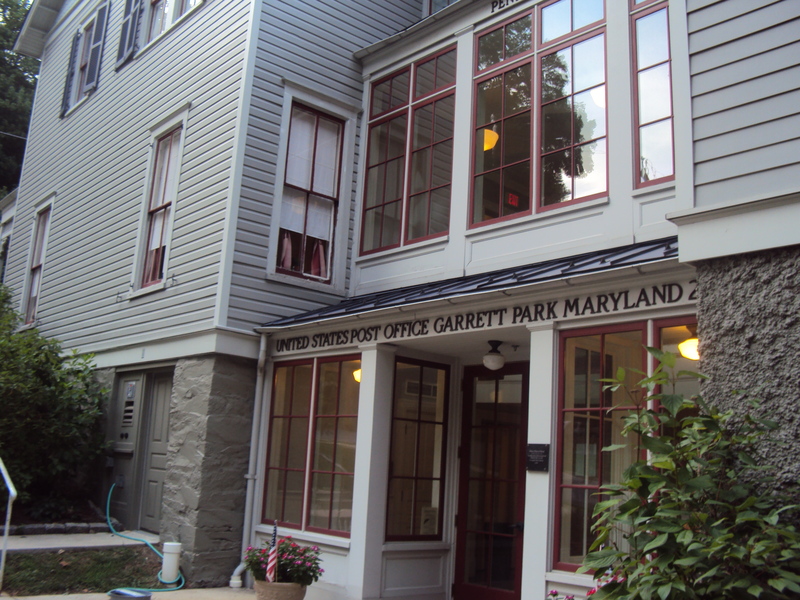 Tucked away in a quaint little post office in Garrett Park, Maryland (with a not so quaint Amtrak track right behind it), Black Market Bistro is a part of the Black’s restaurant family (my second favorite local group, after the Great Americans, of course). Despite the bustling, filled to capacity dining room, the overall feel of the place is warm and comforting. The wait staff is extremely pleasant and gracious; our waitress never once huffed about the fact that she had to come by four times before my two dining companions and I were ready to order (and, it wasn’t like we really needed to look at the menu–the three of us are pretty standard in what we order when we dine together). 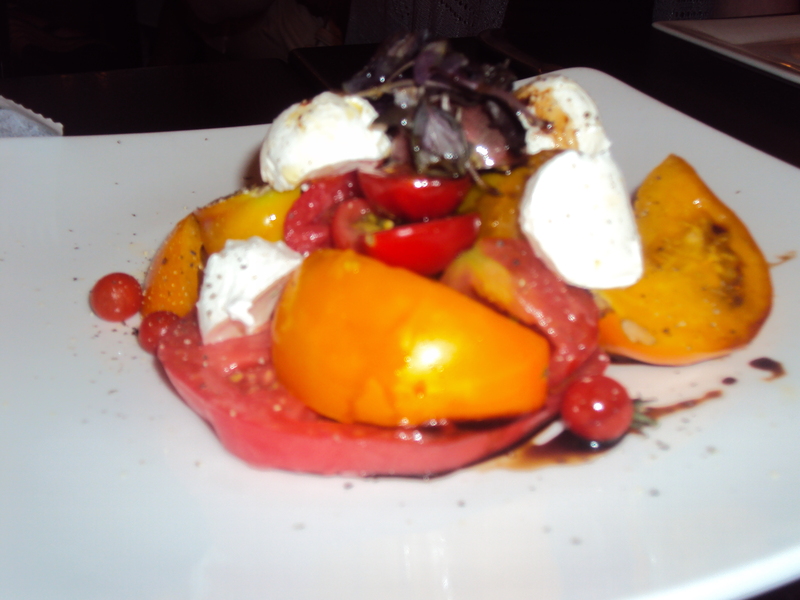 The specials for the evening highlighted the greatest joy of summer: the heirloom tomato. There was a crostini w ith ricotta cheese, basil, and tomato. There was also a gazpacho with basil. Our choice was the heirloom tomato salad. Our tomatoes (all shapes, sizes, and colors) came served with small balls of mozzarella and drizzled with balsamic vinegar. The tomatoes were perfectly ripened–not grainy or mealy, they were juicy and crisp. The balsamic was the perfect acidic counterpart to the sweetness of the tomatoes. The other menu appetizers seemed to mostly be of the seafood variety; while appropriate for the season it was not, to me, appropriate for the area (call me a snob, but I’d prefer to have my seafood closer to the sea). There were several different musssel dishes (one Thai inspired, one with garlic, shallots, and tomatoes), and some cornmeal crusted oysters. There was also a squid salad and an atipasto platter. The dinner menu was quite varied. Thin crust pizzas started off the options. The dinner entrees, much like the appetizer ones, had many seafood choices–trout, salmon, tuna, and shrimp. 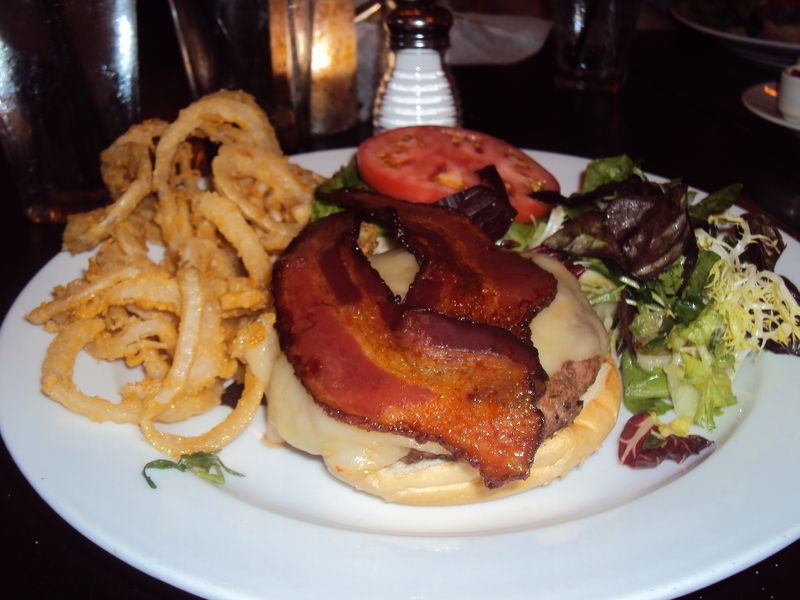 There was also the typical fare of chicken and steak but, of course, we all three gravitated toward the burger. I know that, to write a proper review, one must really sample as many different items as possible. We? Failed. The burgers were fantastic (and at least we had them different ways). With the options of cheese (cheddar, pepper Jack, provolone, or Point Reyes bleu) and bacon, we went crazy with variations. The burgers came cooked to order (perfectly medium rare), the juices soaking perfectly into the sesame seed bun (as one friend said, “You don’t see these much anymore…it’s more of a Kaiser world.”). The burgers come with a salad and crispy onion strings. French fries appear no where on the menu. The mixed green salad left much to be desired (including dressing, in my opinion) but the onion crisps were a welcome accompaniment. And then? Comes dessert. BMB makes all breads and desseerts in-house, daily. (Aside: the bread basket held several slices each of regular white baguette type bread and what we determined was an Irish soda bread with currants. Neither disappointed. What was slightly disappointing was the pre-packaged pats of butter. I prefer a vat of real, don’t have to open a gold wrapper, spreadable goodness.) We each ordered our own dessert and, among the three of us, were able to sample the root beer float (“Root beer does something amazing to the texture of the ice cream”), the blueberry pie slab (a la mode, of course, and a slab it surely was), and the chocolate panna cotta (“This really is quite chocolatey”). The blueberry pie, which was my choice, was so beautiful–the granulated sugar sprinkled all over the crust made the pie sparkle. The garnish of fresh peaches tasted as though they had been picked straight from the tree and delivered to the pie man (after which they were marinated in some sort of citrus). Before we knew it, we had been sitting at the table for almost three hours. Not once did anyone try to rush us and not once did we ever realize the amount of time we had spent eating and laughing. If you’re looking for a kind of out of the way place (I mean, it’s right off of Rockville Pike, between Kensington and Rockville) with a comfortable atmosphere that offers a seasonal and well-priced menu and you don’t mind the occasional freight train rolling through, Black Market Bistro is the place for you. Telling It Like It Is. · Sometimes I'm snarky. Sometimes I'm not. It's up to you to figure it out.